It is our desire to use our gifts and talents to serve our community with our special brand of magic. Here are some recent ways our princesses have volunteered their time to brighten the lives of our fellow Central Arkansans! Our performers have volunteered to appear at Whole Foods Market in Little Rock for story times, song performances, dance lessons, and photo-ops to support the Whole Kids Foundation! Check our Upcoming Events page to see which characters will be appearing next! Willow was diagnosed Acute Lymphoblastic Leukemia in August of 2017. She was having a tough time with chemo treatments and all she wanted to do was to come back to her dance class. When she was finally able to, her dance instructor at Cabot Dance Academy contacted us about having a birthday and "welcome back to dance" party for her. 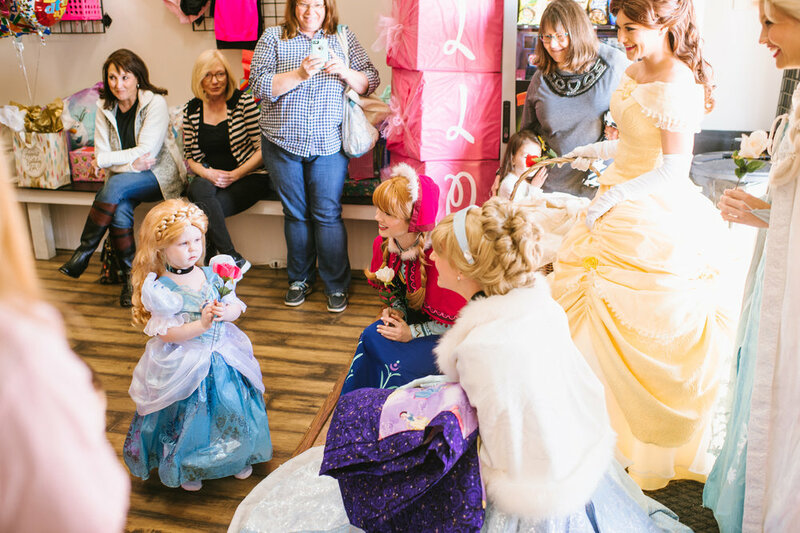 Needless to say, our princesses were there in a heartbeat with smiles, hugs, and even a special princess quilt for Willow to take with her for her treatments at the hospital. It was a day that none of us will ever forget! Princess Kate wanted her three favorite princesses to join her and her friends for her birthday celebration. Our performers immediately jumped on the chance to show up and fill her day with magical memories! Do you know of a little princess in need of some encouragement? Contact us at parties@fancyful.com so we can work our magic!